The choice of vibrant colour play and a sensational mix with gold borders makes this dupatta /Scarf/Shawl/Wrap simply impossible to resist! It’ll pair beautifully with different salwar kameez and kurties/Tops for exalting lavish elegance and wealthy look. This gorgeous chiffon dupatta in auspicious green colour can be utilized as a bridal Dupatta /Chunri to cover head and shoulders all the way through functions and ceremonies. It will also be draped around deity Idols and altars. 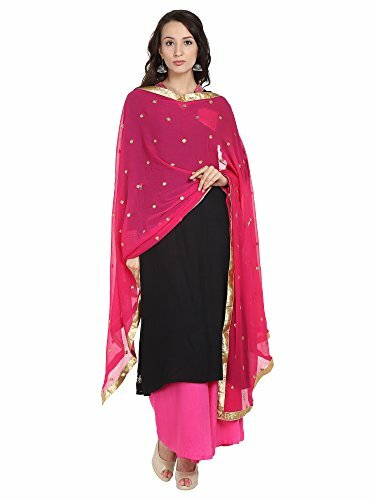 Let the creative side of you show by the usage of unique ways of utilizing this dupatta Worn around the neck, head or waist for warmth, cleanliness, fashion, or religious reasons. It may be made into a curtain, beautiful carry bag or can be utilized wonderfully to gift wrap something special. A perfect gift for girls and women for all occasions. For viewing our complete range of stunning dupattas and scarfs please click on ‘Dupatta Bazaar’ above the title. Any Accessory/Top/Bottom worn by model isn’t included.